Recipe base from The Recipe Critic (LINK). This recipe was sent to me by a colleague who I misguidedly believed was actually going to make them himself. After two or so weeks, I realised that the expectation was for me to bake them. So with some misgivings, I did. 'Why the misgivings? ', I hear you cry, or more likely not. Well, firstly, I have never even heard of a snickerdoodle*, let alone know what one is meant to taste like. Secondly, the recipe involves Cream of Tartar (not commonly available as far as I know in Sweden), as well as caramel squares (after looking at the pictures, I think this is what I as a Brit, would refer to as fudge). Thirdly it requires browned butter, and after the last recipe that required this (see Triple Chocolate Merlot Bundt Cake), I was sceptical about going through the process for what I viewed as very little reward. Do Americans habitually brown butter for their baking?? I have only used it for one recipe, in which its unique flavour is key, and therefore is worth the trouble. There! My three reasons for not doing them. I ploughed on, as once a recipe has piqued my interest, it will keep tickling my brain until I try it. *I have since found out that a snickerdoodle is a biscuit (US cookie) rolled in cinnamon and sugar prior to baking. I had grand ideas of making my own fudge (yeah, right), so settled on that awful 'pick 'n' mix' fudge instead. I bought around 300g, which was more than enough for two batches. Upon reflection, I would get a better quality, or at least, softer fudge that would melt more readily to get the desired effect. I used freshly ground salt that was at home - I do not think it was sea salt, however it seemed a smidgeon better than table salt. The batter was very soft when it came together, therefore was very easy to combine - I love recipes that require the butter to be soft (melted rather than browned). I refrigerated the batter for around an hour, and it was still very pliable and easy to handle. I had cut the fudge into very small pieces, so used two or three pieces within the ball of dough. After the first tray with six biscuits, that spread more than I expected, I reduced the number of biscuits per tray to four. I think I made 20 biscuits, baking at 170°C for 9 minutes per tray. Batter was refrigerated for around 6 hours, so was a lot stiffer. I would disregard the note to chill the batter overnight, as it would be impossible to work with. Learning from the first batch, I cut the fudge lengthways into halves or thirds so that rather than using three cube-like pieces, I would use one or two slab-like pieces. Four to a tray again, I made 21 biscuits, baking at 170°C for 9 minutes per tray. Consistency next day, and day after that was still pleasantly chewy. The browned butter definitely made a positive addition to this recipe. I felt the 'rolling' sugar and cinnamon could have been reduced to 40g and 1.5 teaspoons respectively. 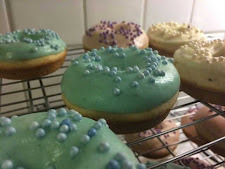 I may make these again, however I found them exceedingly sweet even with the contrasting salt sprinkling, so will not be rushing to make them again. *correction! All purpose flour is plain flour. Not sure which information led me astray before!